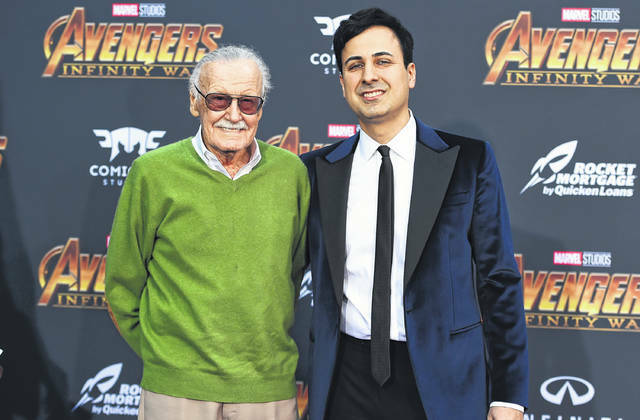 In this April 23 photo, Stan Lee, left, and Keya Morgan arrive at the world premiere of “Avengers: Infinity War” in Los Angeles. Lee has taken out a restraining order against Morgan, who had been acting as his business manager and close adviser. Lee took out the order Wednesday, two days after Morgan was arrested on suspicion of filing a false police report. LOS ANGELES — Los Angeles police are investigating reports of elder abuse against Stan Lee that come amid a struggle over the life and fortune of the 95-year-old Marvel Comics mogul, court documents showed Wednesday. Morgan’s arrest and ouster is the latest and most dramatic move in the fight that has emerged over Lee’s business and estimated $50 million fortune since his wife of 69 years Joan died in July. Morgan was released Monday after his arrest. He is already serving two years of probation for making criminal threats in an unrelated dispute, and he has been summoned back to court to determine whether he has violated the probation.